Two months of tiresome interviews and photo sessions, seemingly endless forms to be completed and grueling psychological and physical exams at Johnson Space Center, have not diminished the sense of adventure and excitement of HC’s payload specialists. Greg Jarvis and John Konrad, the two primary candidates, and Bill Butterworth and Steven Cunningham, the two backups, were chosen from 600 applicants to fly next year’s March and August shuttle missions which will launch Leasat 3 and 4. Hughes’ payload specialist program marks the first time a commercial customer will participate in the launch of a privately owned satellite. 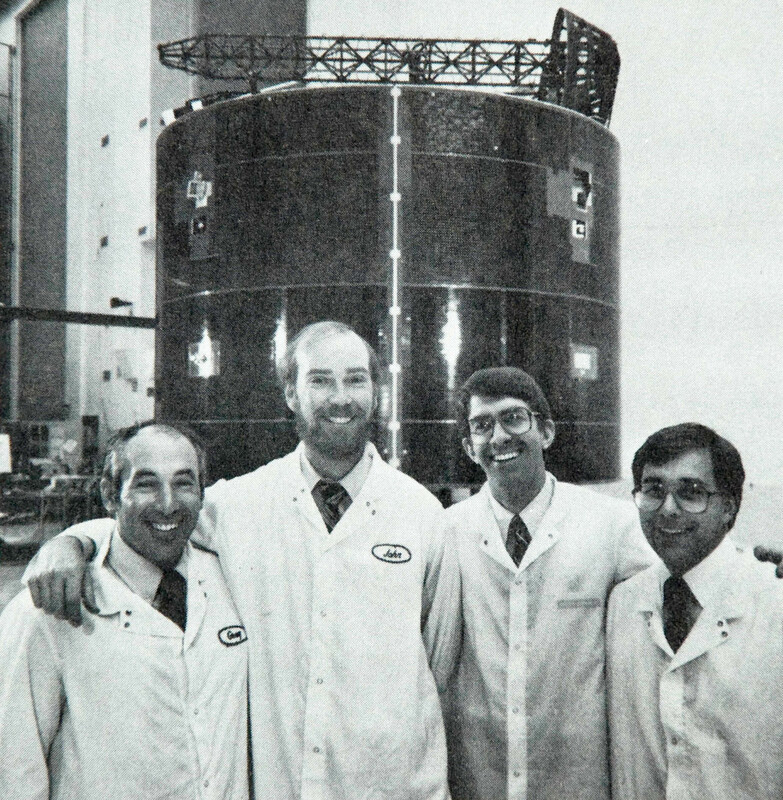 Payload Specialists Greg Jarvis, John Konrad, Stephen Cunningham, and Bill Butterworth pose in front of Leasat 3 for television cameras and the press in High Bay. The payload specialists also spent 2-1/2 hours answering psychological exam questions. Most of the questions focused on their relationships with authority figures, especially their parents and bosses. This is because each new crew member’s relationship with the flight commander is crucial to the mission’s success. Other questions were not so logical. For instance, each of them were asked to decide whether they were most like a fox, puppy, owl, beaver, cat, or tortoise. They’re still waiting to hear whether they passed both the physical and psychological tests. Greg Jarvis is scheduled to fly on the March 1985 mission of the Discovery and he and his back-up Bill Butterworth, will begin intensive training in early January of next year. Their training will include studying volumes of text on the Leasat spacecraft and learning how to operate within the confines of the space shuttle. This should take extra effort on John Konrad’s part since he is 6’ 5” and may turn out to be the tallest man in space. John Konrad and his back-up, Stephen Cunningham, will begin intensive training two to four months before the August 1985 flight of Columbia. Before any training begins, the payload specialists will return to Houston in mid-September with Cindi Whalen, Manager of our Public Affairs office who, with assistant Elizabeth Hess, is coordinating all of their activities. The payload specialists will view safety training films and go through additional tests, one of which will test their ability to withstand oxygen deprivation. They will sit in an air-tight altitude chamber while the air pressure is slowly reduced. Their activities will be monitored and may include anything from giggling to blacking out. They will then fly to Kennedy space Center for tours of the shuttle and launch pad and other NASA facilities. The payload specialists hope to share as much of these experiences with fellow Hughes employees as possible. This newsletter will continue to report on their latest adventures.